The 2016 San Diego 2-4 Units 3rd Quarter Report (Jul 1 – Sep 30, 2016) consists of the following data/charts. When assessing the price changes from the second quarter compared to the first quarter, it’s an evident mixed bag of increases and decreases. Even the median and average figures are conflicting when you look at the 2-4 unit market as a category. Overall, it’s still a better performance than last quarter. When comparing year-to-date sales prices, it’s evident there are improvements in prices and this is consistent with the results we’ve been seeing all year. One noticeable point to highlight is the fact that the YTD price increases are lower than last quarter’s. While it is positive to see continual price improvements from last year to this year, it is worth observing this drop in YTD improvements. While price changes in the market are showing mixed results, the data for days-on-market continue to show double-digit improvements. San Diego 2-4 units continue to sell faster than the previous quarters. Looking at YTD performance shows similar progress. San Diego 2-4 units are continuing to sell very quickly. Overall, this quarter showed 2-4 unit properties selling at faster rates than last quarter and considerably faster than last year. Interestingly, we are seeing a second quarter of mixed results in terms of price increases/decreases. Comparing YTD prices from last year to this year, there are still respectable gains in price. However, it is noticeably less impressive than in the past. This may be a further indication that the market is in a period of cooling. Although properties are still selling very quickly, that may be partially attributed to the reduction in overall activity and availability of desirable properties on the market. 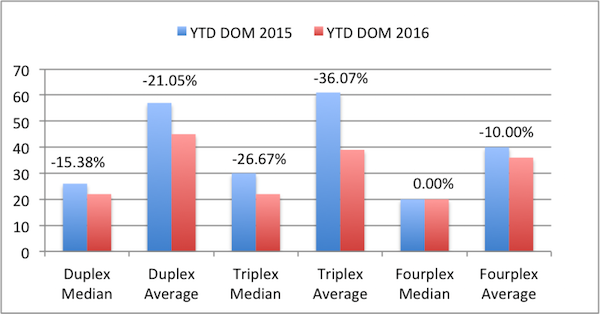 There are generally less 2-4 unit properties selling YTD than this time last year. As always, market activity is a subject than can be discussed at length. For further discussion or for consultation regarding your next 2-4 unit purchase or sale, please don’t hesitate to call!